Poster print of “The Arrival of the Acadians in Louisiana” by Robert Dafford; 20"x10", full-color lithograph, includes mural key. 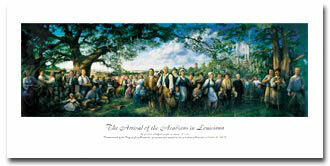 “The Arrival of the Acadians in Louisiana” by Robert Dafford; 26” x 12” signed & numbered limited edition print. Acadian Odysey Quilt color poster, 12"x18". Tiles that Bind color poster, 12"x18". Place an order over the phone with a credit card number or call us with questions about your order during regular office hours, Mon-Fri 8am-4:30pm. Orders are filled after payment has cleared; we pack and ship purchased items once a week. Please allow 2-3 weeks for delivery after you place an order.